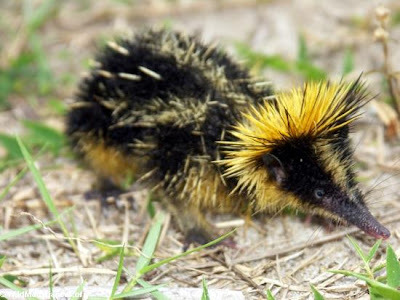 Remember our old friend the streaked tenrec? Tenrecs are a family of insectivores that occur only on Madagascar, where they've evolved to fill all sorts of ecological niches and developed into forms that look like all those other insectivores that are absent from the island. So you get tenrecs that look like hedgehogs, shrews, and, as in the case of this species, a scrub brush having a bad hair day. Making a sound by rubbing body parts together, called "stridulation," is familiar in creatures such as crickets. 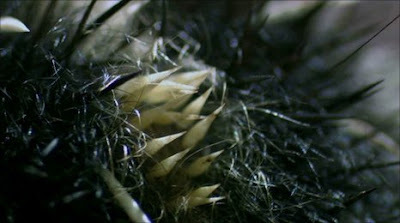 But apparently it had never been filmed in a mammal before, and now, in this clip from the BBC, you can not only hear it, but see it close up, and I have to say, it is actually kind of creepy. Go check it out. They are cute in a punk toilet brush sort of way. And cool too. It kind of reminds me of a duckling. Madagascar on BBC is fantastic. I knew that the island had it's very own species etc, but that there are so many specialised creatures there I had no clue of! However, I did think that it would be more protected as a whole! That series and Human Planet are my current favourites on the beeb! !